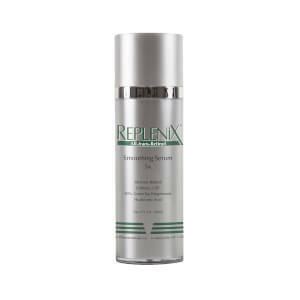 Treat your skin to the smoothing and protective properties of Replenix RetinolForte 3x Treatment Serum, an anti-ageing formula enriched with antioxidants and Retinol to promote a youthful-looking complexion. Utilising a patent-pending Micropolymer Delivery System that delivers age-defying results without irritation, the refining serum helps to diminish the appearance of fine lines and wrinkles whilst encouraging a more even skin tone. Its dose of 90% Green Tea Polyphenols and Caffeine USP work in synergy to prevent irritation and minimise signs of ageing. Skin feels smoother, firmer and healthier. Retinol, 90% Green Tea Polyphenols, Caffiene USP, Hyaluronic Acid Caprylyl Methicone, PEG-12 Dimethicone/PPG-20 Crosspolymer, Dimethicone, Caffeine, Cyclomethicone, PEG/PPG-18/18 Dimethicone, Camellia Sinensis (Green Tea) Polyphenols, Retinol, Sodium Hyaluronate, Polysorbate 20.